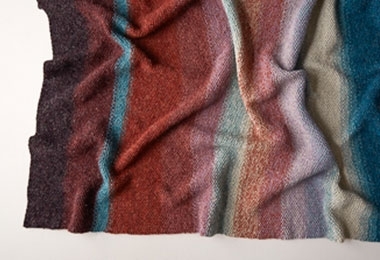 Our Nature's Palette Blanket is for the nature-loving, the color-obsessed, and the fiber-infatuated! Linen Quill's raw blend of fine highland wool, alpaca and linen conjures nature’s rugged beauty and is the perfect foil for this blanket. And in double stranded seed stitch, a nubbly texture and a hearty heft add a whole other layer of satisfaction! This Bundle includes the 14 skeins of Linen Quill you’ll need to get started on your own gorgeous Nature's Palette Blanket. Click Product Details, above, for more information. Our Seagrass Basket is a thing of beauty! Handwoven in Hanoi, Vietnam, these baskets are traditionally used for harvested rice. We fill ours with fabric scraps, skeins of yarn, blankets in progress, toy cars and trucks, stuffed animals, and even potted plants. It's a wonderful way to store the things you love!